When the Dallas Stars selected left wing Michael Neal in the fifth round (No. 149 overall) in last weekend's NHL Entry Draft, educated hockey observers and die-hard Stars fans immediately recognized the youngster's last name. Michael's older brother, James, was selected by Dallas in the second round (No. 33 overall) in the 2005 Entry Draft, and has since blossomed into one of the club's top prospects with the Plymouth Whalers in the Ontario Hockey League. 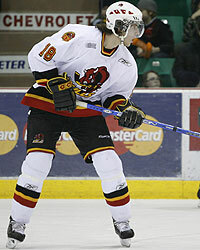 James was on Team Canada's gold medal-winning squad at the 2006 World Junior Championships, was named to the All-OHL first-team and signed a three-year contract with the Stars. Michael has made a name for himself with the Belleville in the OHL, recording four goals and four assists for eight points to go with 25 penalty minutes in 52 games with the Bulls last season. The 6-2, 188-pound winger also skated in all 15 of Belleville's OHL playoff games last season, collecting an assist. Prior to last week's draft, the Whitby, Ontario, native was ranked No. 153 among North American skaters by the Central Scouting Service. 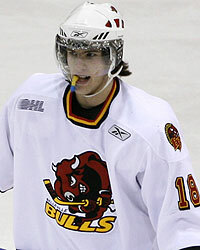 Michael's first OHL goal came against his brother's Plymouth club on Oct. 22, 2005, and the 18-year-old will again play in Belleville for the 2007-08 season. Neal will also take part in the Dallas Stars' 2007 Summer Development Camp for draft picks and top prospects next month in Frisco. DallasStars.com had a chance to visit with Neal to get his thoughts on joining his brother in the Stars organization and his goals for the future. DallasStars.com: First of all, Michael, congratulations and welcome to the Stars organization. What were your emotions when you heard that Dallas selected you in the draft? Neal: "I was so excited and it was just a dream come true to join my older brother, James, in the Dallas system. It was really exciting and I hardly knew what to say when I got the phone call from (Director of Amateur Scouting) Tim Bernhardt. I was hoping Dallas would be the team that selected me, but the draft can be so unpredictable at times and I knew anything could happen. I talked to a handful of other teams and I wasn't really sure when I'd get picked, but when Dallas called, I was just thrilled. There will definitely be more Stars sweaters in our hometown now!" DallasStars.com: What has James told you about the Stars organization and the city of Dallas? Neal: "James really loves it in Dallas and he raves about the facilities there. He said the rink is amazing and the dressing room is absolutely top-notch. He loves the organization and the people treat him really well, so I'm excited to be a part of that now myself. It sounds like a first-class organization, so I'm lucky to be picked by the Stars." DallasStars.com: What was it like to play against your brother's Plymouth Whalers clubs the last two seasons? Neal: "I definitely had those games circled on the calendar, and it was awesome to make the road trips down to Plymouth to play against him. We would try to spend some time with each other the night before in the hotel, and then we'd see each other after the game. It was so exciting and there were definitely a lot of bragging rights in those games." DallasStars.com: What kind of motivation is it for you to see some of the success James has had? Neal: "It's a big motivation for me to see some of the things he's been able to accomplish. From winning gold at the World Juniors to signing with Dallas, it really pushes me quite a bit to keep working hard and try to achieve those things myself. In the back of my head, all of his success serves as another voice to keep pushing." DallasStars.com: How would you describe your style of play, and to whom in the NHL would you compare your game? Neal: "I try to pattern myself after my brother, but at the NHL level, I see my game as being similar to Gary Roberts from Pittsburgh. He plays a strong, physical game and he's willing to go into the corners to get the puck out and finish a little bit. I like to think that I'm a hard-working player who enjoys physical play, hard forechecking and trying to contribute offensively when I can." DallasStars.com: What are your summer plans, leading up to the Stars' development camp next month? Neal: "I am going to work out with James and we will push each other hard. That serves as good motivation to keep working out. After my season ended with Belleville, I came home and rested for a week but then I was right back at it. There's not a lot of time to rest as a hockey player and now that I've been drafted, I'm going to push myself even harder." DallasStars.com: We understand there is another Neal brother coming up through the ranks? Neal: "My younger brother, Peter, was just drafted into the OHL by Plymouth. He's a smaller guy but he's going to grow and get bigger. He's got great hands, he sees the ice well and he'll be a good player in another couple years."